Karl Chevrolet's octagon-shaped F&I waiting room has a finance office along each wall and computer monitors that track customer appointment times. Worried that long waits in your F&I office are irritating customers? Karl Chevrolet in Ankeny, Iowa, isn't. Not anymore. That's because the suburban Des Moines store's automated scheduling system and monitor-equipped F&I waiting area work in tandem to connect customers with finance managers faster. Since the redesigned finance area opened in March 2011, F&I wait times have nearly vanished, customers are buying more aftermarket products -- service contract sales are up 10 to 15 percent -- and salespeople, relieved of caring for waiting customers, are freer to sell more cars. 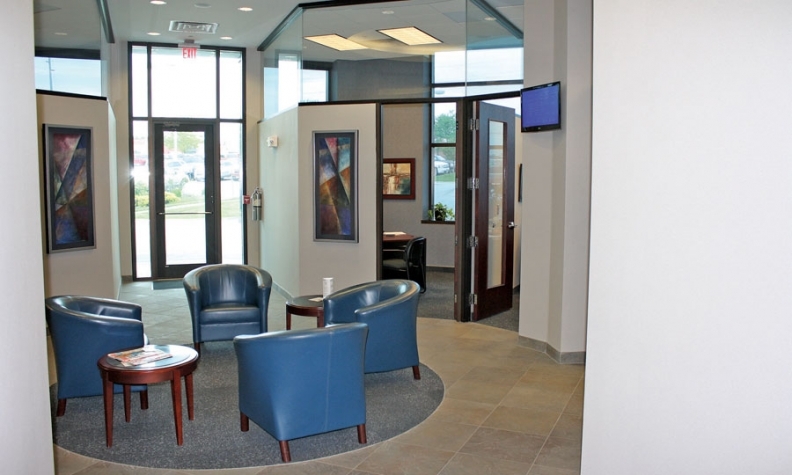 A little over a year ago, Karl Chevrolet moved its new-car delivery area to another part of the store and converted the vacated space into an octagon-shaped F&I waiting room that houses a finance office along each wall. Customers seated in the center of the octagon can view two computer monitors that track appointment times. The monitors are tied to software developed by Karl's in-house programmer that assigns customers to one of the dealership's nine finance managers and four delivery coordinators. The customized software makes it easy for sales staff to book a customer's F&I appointment in advance or to find a finance manager on the spot to close a deal. Salespeople simply click an icon on their personal computers to see which finance managers and delivery coordinators are available and when. Information is updated throughout the day, so sales folks know times are accurate. "Before, it was hit or miss with salespeople trying to find finance people. Now they know who they can call and who's available," says Tom Beschen, finance director for 12 of the 22 years he has worked at the dealership. F&I wait times at the dealership -- which in 2010 sold 4,600 new and 2,400 used vehicles and often delivers 35 to 40 vehicles a day -- have been pretty much eliminated. Beschen likes that he and his colleagues now have a better idea of what their day will look like. "The economies of saving time are really nice. There are a lot less upset salespeople and customers," he says. "Salespeople don't have to babysit [customers] anymore. There hasn't been any resistance from anyone." Beschen got the idea for automating F&I scheduling after noticing how his dentist was using a similar scheduling process to boost office efficiency. When the dealership couldn't find commercially available software to meet its needs, it built its own. Customers whose appointments were booked in advance receive an e-mail reminder with the date and time and photos of the sales, finance and delivery department personnel they're scheduled to meet. "It puts a little weight on it," Beschen says. "Everyone buys in, and customers show up on time." Karl Chevrolet is averaging 1.2 F&I products per vehicle sold -- a figure that was running closer to 1.0 before the project, Beschen says. Sales of service contracts and credit insurance have increased the most since the renovation, with service contract sales up 10 to 15 percent based on same-month year-ago comparisons, he says. Other popular aftermarket products include GAP, tire and wheel, paint protection, sealants and maintenance. Although Beschen admits it's hard to say that one thing has been responsible for the increases, he says he has received positive feedback from customers about the F&I improvements. Customers say, "This is the best process we've ever had" or "Man, do you treat all your customers like that?" The scheduling software is working so well in the finance department that last month, Karl Chevrolet incorporated the cleanup crew into the system and added a monitor to the vehicle-preparation workspace so that crews will be able to see which vehicles need to be ready when. Beschen believes that every dealership, big or small, should adopt some strategies to improve the traffic flow in its F&I department. Although Karl Chevrolet spent money to remodel its F&I waiting area -- an amount the dealership declined to disclose -- Beschen doesn't believe renovation is essential. "The facility is fantastic," he says, "but you can do without that if you have scheduling in place."